Our Deluxe Universal Gun Cleaning Kit features a complete assortment of universal gun care components to clean a large variety of firearms. 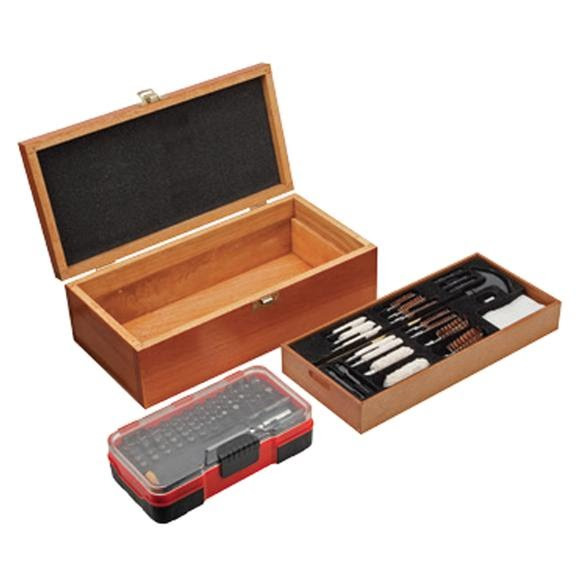 The 28-piece cleaning kit also includes a quality 51-piece screwdriver and bit set for a variety of light gunsmithing or scope-mounting tasks. I recently purchased a 79 pc deluxe cleaning kit with tool set. I'm very pleased with thus purchase. Time and again I have needed one more cleaning brush or gun tool only to find I'm lacking it. This is usually due to poor organization on my part. My old kid often contained several of say, one size of cleaning brush or cleaning rods. Now with my new 79 pc set, I have it all in one organized box. Not just any box either. This box is made of wood, a favorite among gun owners every where. I've recommended one for each of my grand sons.